Matt and I moved to France thirteen years ago just after the birth of our daughter. We set out on an adventure to discover a new life in the beautiful Vendée region of southwest France. Having a background in property development, we found a wreck of a barn and got our teeth stuck into completely rebuilding and extending this challenging project. This house was like our fifth child! Matt built everything from the foundations to the infinity pool, to the beds and oak dining table. This property is now our home where we live with our four children, set in the heart of the countryside with stunning views. Matt showed an interest in cooking from a very young age, sharing his father’s passion for entertaining and creating fabulous food! He worked in various restaurants both in Buckinghamshire, where he was brought up, and in London during his early twenties. His desire to progress and improve, always testing himself, became more apparent after his move to France. The abundance of incredible produce in the Vendée is inspiring and definitely sparked his imagination. Because of the rural area where we settled, and the distinct lack of decent restaurants in the locality, dinner parties and entertaining large groups became a weekly event. Being an outgoing character, he thrived on these dinner parties: designing the menu, creating beautiful plates, choosing matching wines and the buzz of the cooking as well as meeting new people in a welcoming atmosphere and taking banter to another level! 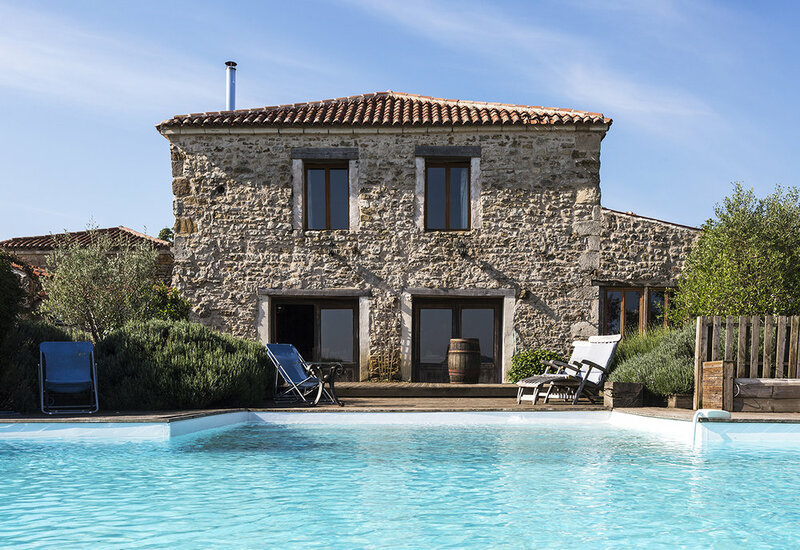 Whilst running his own building and development company, Matt also found the time to renovate two large houses and build a third from scratch, all in the Vendée region, which subsequently we rent out for holiday makers. It was at this point that Matt’s career took a turn as he focused on the cookery. 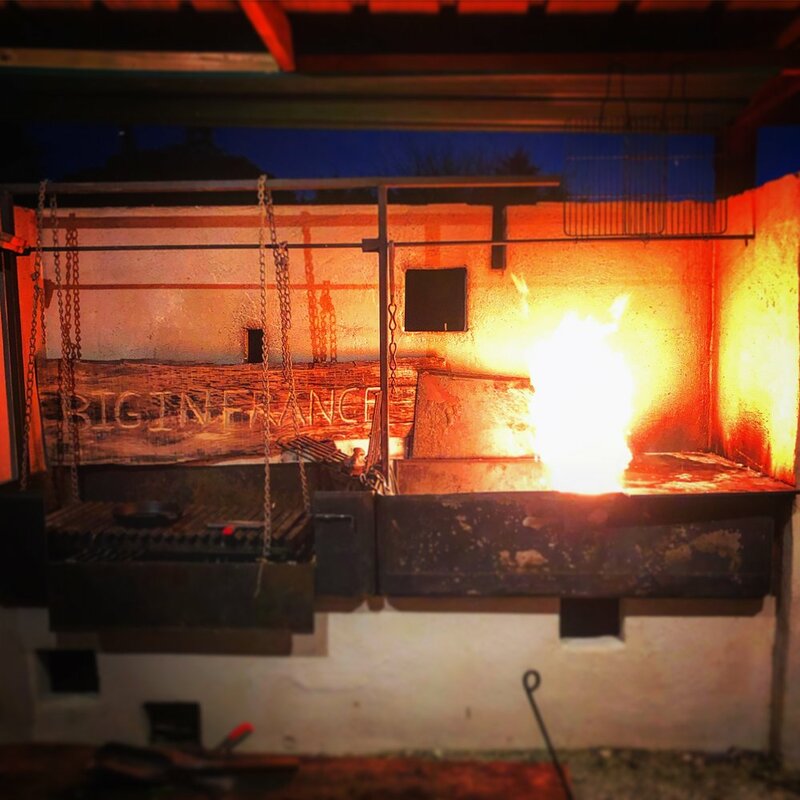 The concept of Big in France was born! After studying languages at ‘A’ level, then completing a degree in english and linguistics, I had spent most of my adult life raising our young family. With our four children growing fast, we could find the time needed to dedicate to a new venture together. We decided to spend our time doing what we love and to incorporate activities into our holiday packages. We now offer photography, cookery and yoga holidays, as well as private catering for weddings and events which we host. The setting and the weather is wonderful, the second sunniest region in France. 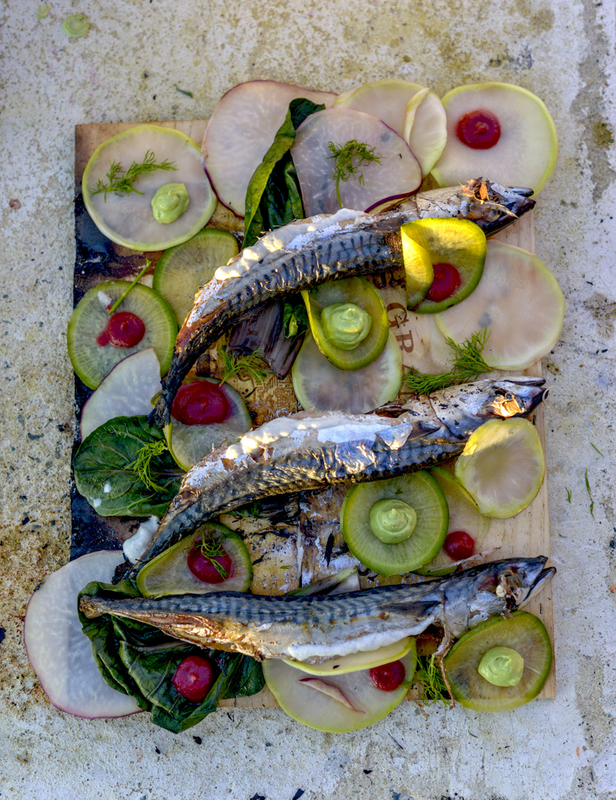 To really embrace this outdoor life, we love to cook using wood fires in the recently built cookery school, overlooking the infinity pool and the panoramic views of the stunning countryside. The courses run over a long weekend. After arriving on Thursday afternoon, you will be welcomed to the villa where you can settle in and enjoy a refreshing cup of tea or perhaps a well-deserved beer or glass of wine. For the welcome dinner you can expect a four course gastronomic feast, using local, seasonal, fresh produce where ever possible. We are located near the southernmost vineyards of the Loire valley. After breakfast, we will take you to a vineyard for a tour and a tasting. A light lunch in a local auberge can be enjoyed after working up an appetite, strolling around the picturesque chateau in the warm french sunshine. A couple of hours relaxation by the pool or maybe a cheeky siesta before the afternoon masterclass begins. We aim to create a welcoming and friendly environment where you can do as much or as little as you choose. After the fires are lit, the prep can begin. 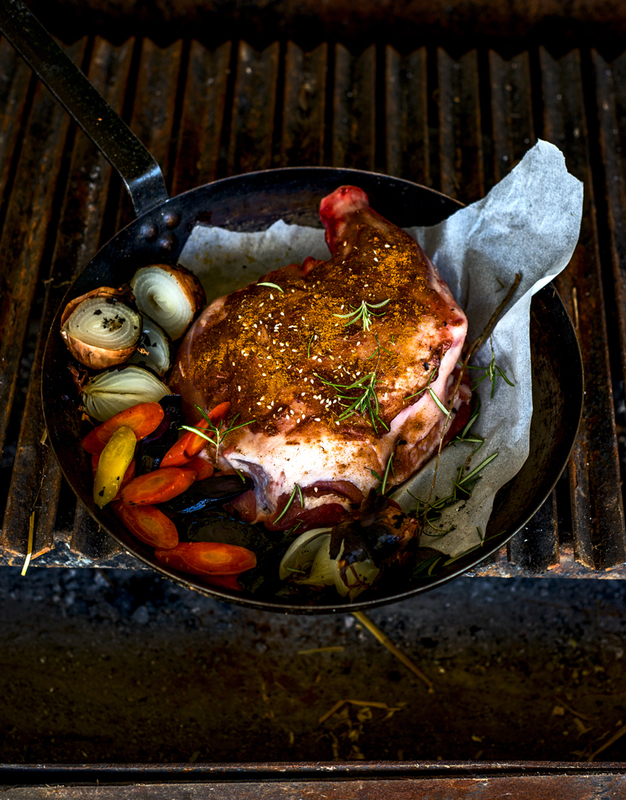 Late afternoon, the group will be encouraged during the 2-3 hour masterclass, to help with the cooking process from start to finish, creating their very own superb three course dinner. If there is something in particular that you would like to focus on then we will take the time to teach you. For example, you can expect to learn knife skills, preparing fish, portioning a bird, the perfect stock, how to make a flavorsome, glossy sauce to bring the dish together and of course, appetizing canapés and decadent desserts. 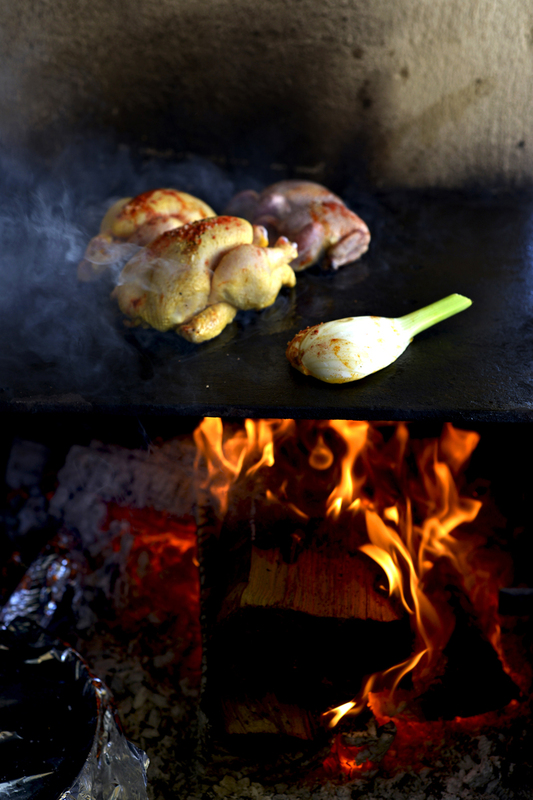 You can master cooking over fire with elegance! With the delicate hint of lavender in the breeze and the twinkle of the fairy lights, relax as the sun goes down and have a wonderful evening together, enjoying incredible food and company. On Saturday morning, after a delicious breakfast, we will accompany you to the beautiful, historic town of Fontenay le Comte and it’s fabulous market. Together we can look at the produce and choose ingredients for the Saturday night feast. An ideally located restaurant in the heart of the market is the perfect spot to enjoy lunch. The evening masterclass will begin after a peaceful and restful afternoon. Expect to go out with a bang! With such excellent produce, your tastebuds will dance as you indulge in the fantastic meal, cooked by the group with the help of Matt and Emily. On Sunday morning you will be served a classic continental breakfast before transfers back to the airports. This is a weekend to remember! It really is a magical experience, combining great food and drink in an idyllic setting with the wonderful French sunshine! You will stay in our flagship villa., a fantastic 9 bedroom farmhouse with a private, heated infinity pool and stunning panoramic views over the rolling hills and beautiful surrounding countryside. 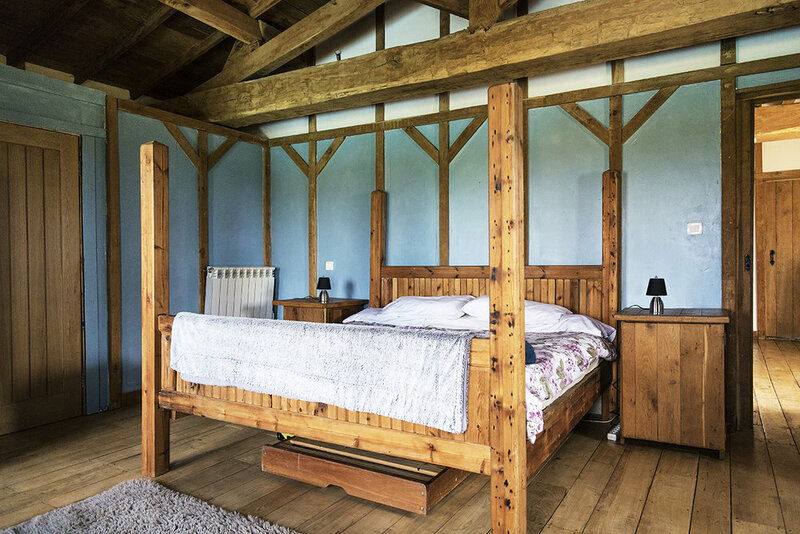 This magnificent, sympathetic restoration comprises of 4 kingsize bedrooms and 5 double bedrooms, Enjoy over 400 square metres of beautiful rustic French farmhouse all constructed by Matt. 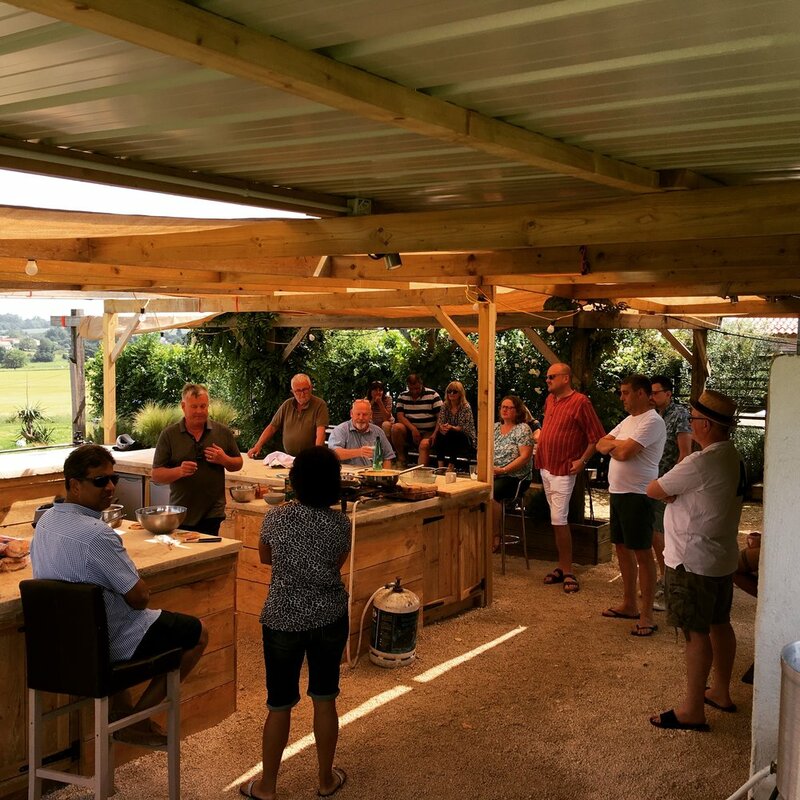 We have recently designed and built a wonderful outdoor cookery school with a pizza oven, plancha, Argentinian grill and tandoor oven, you really are spoilt for choice. This is where the cookery masterclasses will take place and where the magic happens! 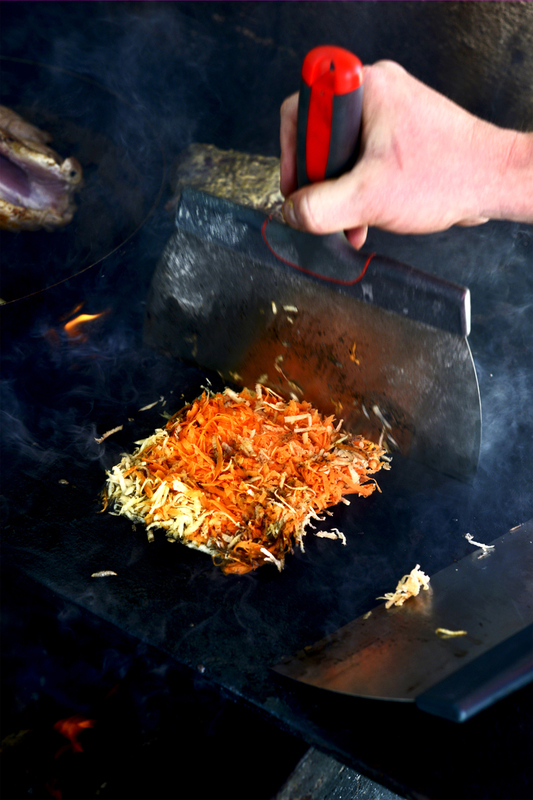 Served with tarragon, sweet potato and parsnip rösti cooked on the plancha.